Jaso’s new 700tm electric luffer has made its debut in Sydney, Australia, where it is working on Grocon’s new Darling Harbour development, The Ribbon. The first unit of the new Jaso J780PA electric luffer, one of the largest of its type, has been assembled in Sydney, Australia, where it will be working on Grocon’s $700m high profile development The Ribbon, at the Darling Harbour. Despite being placed at a restricted site bounded by two motorways, with limited access for trucks and few options for the positioning of the mobile crane used in installation, the giant luffer was erected in just two and a half days. The J780PA has been launched in two versions, one version with a maximum load of 75t, hoist winch 110kW and 220kW motor and a ‘smaller’ second version J780PA.64 with 132t winch and ML 64t. For the first project, Jaso had to meet specific load requirements. 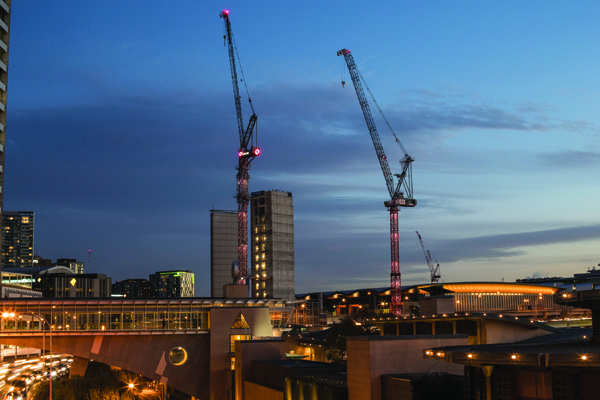 The crane’s designers focussed on competing with cranes like the Favelle Favco MD760D and MD860. However, the company says, they looked to rival other electric cranes in the 700tm luffing class, as much as diesel electric models. The target markets for these cranes are high rise construction, prefinished prefabricated volumetric construction (PPVC), and mining. Jaso sees these as areas where an electric luffer is a perfect answer to commonly used diesel-powered hydraulic cranes. The manufacturer is targetting Asia, Australia and the USA. This year two units will be manufactured, including this first unit at the Sydney Ribbon site. The company has had several inquiries which may lead to further orders. The crane’s designers have paid close attention to ease of transport and erection. For the crane’s top kit and 70m boom, only one FR40 flat rack container is needed. To reach a free standing height-under-hook of 37.8m, this single flat rack container needs to be shipped together with just 14 HC40 high cube containers. The A-frame can be folded and transported in a standard high-cube container. Long platforms at the A-frame head offer safe access during erection and service. The double-deck counter jib has been designed in two pieces, in order to make erection easy and reduce component weights: the heaviest load to be lifted during installation weighs less than 21t, and this can even be split into loads of less than 10t. By limiting counterweight options to use only steel ballast, the space needed for this is reduced. This also keeps the centre of gravity low, and reduces the effect of the wind on the counterweight. The crane is powered by a single motor, positioned parallel to the drum in order to save space. Easily accessible electrical cabinets are embedded into the structure of the 9.5m radius counter jib, offering more and better protection against bad weather conditions and keeping them safe during transportation. An auxiliary winch in the A-frame, fitted as standard, is used for erection of ties, bridle and hoisting rope. This same mechanism is used in the davit arm for maintenance and service. The luffing system has been designed with two ropes and two bridles. This provides redundancy, improving safety by making sure that one can hold the jib if the other fails. This also offers better handling during erection, as a smaller diameter bridle rope is used. Finally, this design reduces bridle tilt. The crane can be reeved in direct pull only, as a one-part line, with 28t line pull, and using a special slim line hook block. Alternatively, the crane can be reeved with two parts of line for 56t maximum capacity, or three part for 75t maximum loading. The hoisting rope runs inside the boom, improving its guiding, and making erection, installation and rope replacement easier and safer. A standard wind sheet can be fitted to the boom foot section for all boom lengths, designed to improve weathervaning when out of service for a steep jib angle. As is common in Australia and the USA, the wind sheet can be used for client advertising. The crane’s standard parking radius is between 15 and 20m. For more constricted sites, a special park radius system can be designed, similar to that available for all Jaso luffers. A new design of jib buffer system allows the crane to stay in service with wind speeds from the front of up to 72kph. For the US market, Jaso has designed a fly jib with 9t line pull, which will be available by the end of 2018. The winch for this will be placed on the machinery deck, behind the hoisting winch, not on the jib, for easy access at erection and for maintenance.